The three-year part-time remote learning UNIGIS UK MSc course I recently finished had two very different components – the first two years consisted of teaching modules of learning materials and assessed assignments (see my earlier blog posting about this here), and the third year involved the planning, development and writing of a dissertation, which is the final ‘research’ stage in getting the MSc degree. A dissertation is different from taught components of a course in that it requires formal academic research undertaken by the student and is a significant piece of original work, based on ideas originating largely from the student, and implemented and developed on the student’s own initiative and using their own skills. It is a real test of whether a student has ‘academic’ skills and is what sets a masters postgraduate degree apart from undergraduate degrees. I had been thinking about ideas for my dissertation since the start of the course and I knew I wanted to explore the topic of exploring the physical characteristics of landscape in some way using my existing skills and experience as a web developer and software engineer, allied to the types of analysis and methods that are used in the field of Geographic Information Systems or Science (GIS). The primary starting point for an original piece of research is to establish a ‘research question’ that addresses some area in the field that has not been explored before, so my plan for getting ideas for this was to read as many published academic research papers as I could in the field of GIS that covered areas like land use, rural and upland environments and the use of spatial data models such as Digital Elevation Models. What really sparked the idea for what became my dissertation topic was a paper entitled ‘A GIS model for mapping spatial patterns and distribution of wild land in Scotland‘ by Dr Steve Carver (and others) of the Wildland Research Institute at the University of Leeds. 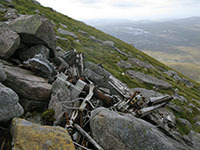 This paper led to a lot of further reading about the use of GIS techniques, spatial concepts and maps to explore the idea of ‘wilderness’ or ‘wild land’ which appealed to my existing interest in mountains, and I decided to concentrate on using the Scottish Highlands as a location for the focus of the research. The idea of ‘wild land’ in Scotland and what this actually means in a practical sense is a topic with some currency and this is seen in contemporary debates and research work concerning parts of Scotland that have been defined as ‘wild areas’ (in this case by Scottish Natural Heritage). The terms ‘wilderness’, ‘wild land’ and ‘wild areas’ have some ambiguity and are reliant on notions heavily affected by human perception, experiences and subjectivity and hence I always put the terms in quotes to denote this lack of precise definition. Much of the GIS research in this area has explored this ambiguity and this would be a central theme of my dissertation. Papers such as ‘Using distributed map overlay and layer opacity for visual multi-criteria analysis‘ gave me ideas about building a GIS web-based tool which could explore the concept of ‘wild land’ in a way that hadn’t been done before. These ideas developed more formally with the research project proposal document I had created for the Methods in GIS module towards the end of second year of the course, but the ideas themselves constantly evolved all the time, right up until the dissertation itself was completed and submitted. The first formal step in the creation of the dissertation was to get my ideas accepted as a coherent piece of valid, justified and original research by the UNIGIS UK team and this was done by submitting a formal MSc project proposal form at the start of the third year. This drew heavily on the research project proposal document I created in the second year and its main purpose was to present a research idea and plan with the potential at that early stage to become a dissertation, before work started in earnest. This is a vital step as it is important that a student does not head down a blind alley of unjustifiable research or take on a task that is beyond the scope of a MSc dissertation or not suitably related to the field of GIS. Once this proposal was accepted, an academic supervisor for the dissertation was allocated to me, and groundwork for the dissertation could start which mostly involved reading previous academic research publications and investigation of GIS-related software packages and web applications. The research for the dissertation was further developed with the Extended Project Outline (EPO), a 2000-word document that benefited from formative feedback from my supervisor so that the ideas in it had been challenged, discussed and developed until they represented a good preliminary ‘grounding’ for the dissertation research to follow. At this stage the aims and objectives of the research were refined in discussions with my supervisor and altered so that they provided a focused target for the direction of the rest of the dissertation work. An important early outcome of these discussions was that I hadn’t initially intended to focus on the public participation geographic information systems (PPGIS) aspect of the web tool, but this change led to the idea of using only ‘open’ data and free and open-source software (FOSS) in the tool and the ‘accessibility’ of the tool becoming a major requirement. ‘The aim of this dissertation is the development of a publicly-available web-based GIS mapping tool, and the evaluation of the effectiveness of this tool in supporting a PPGIS approach, using the example of exploring the concept of ‘wild land’ in the Scottish Highlands’. ‘A web-based GIS tool to allow public exploration of the concept of ‘wild land’ in Scotland’. The title and aim provide a good summary of the entire dissertation and everything in it can be considered as flowing from this. The main research methodology underlining the dissertation was also defined at this early stage, and was to be, broadly speaking, a ‘quantitative’ approach in that it would involve the development of a technical software tool and importantly, an evaluation of that tool. This would be a largely desk-based process involving only my own time and efforts and could be described as ‘prestructured research’ in that it wasn’t open-ended and there was intended to be a clear outcome i.e. a measure of how well the web tool met the research objectives in terms of the ‘quality’ of the spatial data used and the usability of the web tool interface. Some dissertations involve ‘qualitative’ methods such as user surveys, interviews and questionnaires, and I decided at an early stage that this would be outside the scope of the dissertation – although these methods could potentially be used in futher research based on the work in the dissertation. Once the EPO and the dissertation plan was approved (this document actually contributed 10% of the final dissertation mark), then the full work for the dissertation began, and this process took 4 months. Although this was not much longer than is usual for a dissertation in a traditional one-year full-time MSc course, a lot of the groundwork for the dissertation had been done in the preceding 12 months. The dissertation was required by UNIGIS to be no more than 15,000 words and to conform to established academic formats and styling. My supervisor guided me in the process of writing the dissertation with essential feedback on chapters, and contact was maintained throughout this period with Skype audio meetings and emails. An important thing that I learned in this process is that it is important to create a research plan that is achievable within the resources available to the student (principally time) and appropriate for the level of a MSc dissertation – it can be easy to fall into the trap of taking on something that is more suitable for a full PhD, for instance. An important consideration also is the data that is required for the dissertation and whether it can be obtained and utilised within the timeframes and resources available to the student (e.g. licencing restrictions). The focus of my proposal on ‘open’ data and FOSS meant that this consideration was not a major hurdle, and indeed ‘accessibility’ of data and services was crucial to the theme of the dissertation which focused on PPGIS. An important first stage in the dissertation was undertaking of a critical literature review, and this was essentially done as a parallel process with the design and development of the architecture of the web tool. The literature review involved reading a large amount of previous related research and the two areas fed into each other, with the literature defining the methods that others had used in this area and what hadn’t been done before, and the consideration of available technology defining what was possible and which existing applications, software libraries and technology frameworks were appropriate for the task. An important first step in developing the web tool and deciding what technologies to use was the building of a basic prototype to discover if the ideas were feasible and to provide a platform on which to build further. The prototype was just the first stage in the process of software development which broadly followed the Rapid Application Development methodology, which I have extensive experience of, and which in this case involved several cycles of feedback from my dissertation supervisor (particularly concerning the usability of the interface of the web tool) and associated iterative development of the web tool. The actual writing of the dissertation and development of the web tool went largely to plan and allowed me to submit the dissertation on time (at just under the 15,000 word limit) in May 2017. I was able to change the working hours of my job to part-time during this period and this helped greatly. Whilst I spent many hours of my spare time in early 2017 on this, and there were many problems to solve and issues to deal with, things fell into place quite neatly and I am proud of the final product which presented some interesting web technologies and GIS concepts in a novel way within an established research framework. Major outcomes and findings of the research were that the FOSS applications, particularly GeoServer and OpenLayers, and the ‘open’ data, particularly the Ordnance Survey OpenData service (which only became available for the first time in 2010), were very well suited to the objectives of the research and allowed a genuinely useful web tool to be built to investigate what the notion of ‘wild land’ means in a thoroughly-grounded academic GIS research context. The final level of success of the completed web tool was not completely apparent to me at the outset of the process of developing ideas for the dissertation, and even during the development of the web tool and the writing of the dissertation. I believe that the general success of the outcomes of the dissertation reflects the current maturity, sophistication and richness of FOSS GIS applications and ‘open’ data and also shows the new opportunities for research that are available, and that this positive outcome would have been unachievable only a few years ago. The ideas and themes behind the research objectives in my dissertation would have made for a much more difficult undertaking if I had been writing the dissertation in say, 2007 instead of 2017. The dissertation received a very high mark, and combined with the marks I had obtained in the taught component of the course, I was awarded the MSc degree with distinction by the University of Salford in June 2017. This dissertation won an award for best UNIGIS UK dissertation of 2017 and has also been nominated for an award in the international UNIGIS academic excellence prize competition. No Comments Show comments and add comment. I haven’t written anything in my blog for the last three years, and that is partly due to the fact that during that time I have been directing a lot of my energies to a postgraduate course, a Master of Science (MSc) degree in Geographic Information Science or Systems (GIS). I have now finished the course, which went very well. The course was delivered by UNIGIS UK (a collaboration between Manchester Metropolitan University and the University of Salford), and one of the things that attracted me to the course is the remote learning nature of the course and the fact that the entire course of study is carried out part-time over a three year period (instead of the more usual one year for a full-time MSc course). This allowed me to continue working full-time and earning money whilst studying in my spare time for the course. Another attractive thing about the course is that a qualification can be awarded at the end of each successfully completed year of study, a Postgraduate Certificate after the first year, a Postgraduate Diploma after the second year, and the full Master of Science degree at the end of the third year. This is unlike traditional one year full-time Masters courses, where a lot of good work can achieve no credit if a student doesn’t complete the entire course (this happened to me on an earlier attempt at a GIS MSc). UNIGIS UK offers its MSc programme in three different ‘pathways’ and I chose to study the Geographical Information Technologies pathway. The taught component of the course is modular, and is assessed using a mixture of formative and summative assessment methods, with the summative component taking the form of 12 very large pieces of assessed work set in a sequential fashion in the first two years, with two for each module, and which are required to pass the various taught components of the course. These assessed assignments are undertaken by the student at their own pace (although with fixed submission deadlines) in an environment of their own choosing, using their own resources (books, broadband internet connection, computer hardware, software applications, online research etc.) There are no formal summative assessment exams, which I consider to be a major point in favour of this course. Feedback gained from the assessed assignments was very detailed and incredibly useful for advancing my knowledge of GIS as the course proceeded, indicating what I was doing well, and also, crucially, correcting or guiding me in areas where I got things wrong. The 12 assignments I undertook took the form of Word documents comprising a mixture of essays and technical reports in an academic format and style, and are in themselves each major pieces of work. I list them here, along with the modules they formed the assessed components of, and descriptions of the work I carried out for each assignment. Changing boundaries and definitions – a 2500-word essay covering the historical development of the field of GIS and the debate about whether it can be described as a set of technical methodologies or an actual ‘science’, entitled “From GIS to GISc. The symbiotic development of Geographic Information Systems and Geographic Information Science”. Practical portfolio: 1) working with social data; 2) spatial operations and analysis – a technical document describing the practical application of Markov chain analysis with ONS census and DCLG IMD (Index of Multiple Deprivation) data and a site suitability analysis using multi-criteria evaluation and cartographic modelling techniques with Ordnance Survey, Environment Agency and CORINE land cover data, using the desktop ArcGIS 10 application. Spatial data capture, metadata and standards - a technical document describing the creation of a land use map and associated attribute data by manual vectorisation of an aerial image, and the creation of an ISO 19115 metadata record for the created dataset, using ArcGIS 10. Spatial data quality and fitness for purpose - a technical document describing the evaluation of spatial data in terms of ‘fitness for purpose’ and ‘quality’, for the purposes of a site selection analysis, using ONS census, Ordnance Survey and Environment Agency data. NoSQL Databases and ‘Big Data’ – a 3000-word essay describing the advantages and limitations of NoSQL databases, in the contexts of spatial and ‘big data‘. Development database – a technical document describing the development of a relational database using conceptual and logical models (with an Entity Attribute Relation diagram and normalisation methods), the physical implementation of the database model using the PostgreSQL application (with constraints and indexes), and the querying of the database with SQL queries incorporating table joins. Aspects of web GIS practical portfolio: 1) interoperability and standards; 2) the benefits and challenges of distributed GIS – a technical document describing the construction of OGC WMS- and WFS-specification compliant queries to dynamically retrieve PNG maps and XML GML data via REST-style HTTP GET URLs from a remote server, and also the construction of a map within the QGIS desktop application by retrieving data layers dynamically from a remote WFS server – also a 2250-word essay describing the benefits, limitations and challenges of Distributed GIS, focusing on SDIs, the ‘GeoWeb‘, VGI and disaster/emergency management. Design, implement, interrogate and visualise a spatial database - a technical document describing the development of a relational spatial database using conceptual and logical models (with an Entity Attribute Relation diagram and normalisation methods) supporting specified requirements including the production of reports and maps to meet queries about distances and locations, the physical implementation of the database model using the PostGIS application (with constraints, spatial attributes and spatial indexes), the populating the database tables with spatial data, the querying of the database with spatial OGC SFSQL queries incorporating subqueries, common table expressions, spatial table joins and spatial measurements, and the creation of PostGIS views to visualise the results of queries as data layers in QGIS. A mini project of GIS application development – a suite of software files that delivers a basic standalone ‘tightly coupled’ Windows desktop GIS application (using Python, the QGIS API/PyQGIS and the Qt4 libraries) to support an interface that allows the importing and map-based visualisation of raster and vector datasets as map layers, the presentation of attributes, and spatial analysis of the data (a calculation of travel accessibility indexes using point locations), and a technical document describing the development of the software incorporating a user manual – a zipfile containing the package of software files can be downloaded at: http://www.edwardboyle.com/MSc2/eboyle_taa2_pyqgis.zip - to run the application, extract the files from the 110Mb zipfile and run the ‘job_app_bat’ file in the ‘PyQGIS_package_release’ directory. A research design appraisal – a 2500-word document comprising a GIS research proposal in a strict academic format, using as a model preliminary ideas for an eventual MSc dissertation, outlining the research questions, aims, objectives, approach, methodology, methods to be used, and the expected outcomes, all presented in relation to existing academic literature and research, and incorporating an ethics and risk assessment – the proposal was developed with formative feedback from a tutor as well as a peer review process, and laid the groundwork for the dissertation carried out in the third year of the course. A spatial analysis portfolio: 1) point pattern analysis using ArcGIS; 2) implementing geostatistical analysis with ArcGIS – a technical document describing the usage of spatial analysis techniques in ArcGis 10, including descriptive spatial statistics and calculations of nearest neighbour index/ratio for point locations of a supplied dataset of plant locations, evaluation of the methods and conclusions about whether points are clustered or dispersed, whether a pattern is random or non-random, the statistical significance of this, potential causes for the pattern, also spatial interpolation methods (IDW, Trend Surfaces and Ordinary Kriging) using Met Office data, and evaluation and comparison of spatial interpolation methods using validation and calculation of errors. A major component of the course is the research-based dissertation, which was undertaken in the third year of the course, and which I have discussed in a later blog posting here. The remote learning nature of the course doesn’t suit all students, although it follows in the more established tradition of the Open University. In three years I never met a single fellow student or tutor in person, and all communication, discussion and delivery of course material such as lecture notes, demonstrations, tutorials, external resources, workshops, example exercises and self-test questions is done by online platforms such as email, instant messaging, videoconferencing, a web-based Virtual Learning Environment (VLE) application (Moodle) and multimedia and document files. A lot of the work is solitary and a student must rely on their own resources and initiative to complete the work, although there are discussion forums on the course VLE to discuss things with other students and the course tutors, and I was also in an ad-hoc Skype group of students which proved to be very useful. The remote student’s learning experience is heavily dependent on the willingness of the course tutors to engage with the online platforms. Much of the course used readily-available Free and Open-Source Software (FOSS) applications such as PostGIS and QGIS, but importantly, a licence is provided as part of the course so that the commercial ArcGIS desktop software can be used. Other things that are available as part of the course (without any extra fees) are web-based live seminars from invited GIS academics and industry professionals, subscriptions to current GIS paper-based periodical publications such as GeoConnexion and GIS professional, and a copy of the standard GIS textbook, Geographic Information Science and Systems, all of which are mailed to a student’s home. Again, this style of postgraduate study will not suit all students – I believe it suits more mature students who may already have some experience of the field, either in a professional or academic environment, and who are used to working on their own without close direction. The UNIGIS learning environment and approach probably wouldn’t work for a younger person who has just graduated with no knowledge of GIS or things like software engineering or databases. In many ways the course brought together different strands of technical knowledge, skills and experience I have gained from several disparate environments in the 24 years since I graduated and the course allowed me to present them in a formal way to achieve the MSc degree. The course fees may seem steep, but are reasonable compared to equivalent postgraduate courses and a major attraction of the course is the ability to pay the fees in instalments. A prospective student may well ask what these fees buy them, particularly in the context of remote-learning where a student is expected to rely a lot on their own resources, and a lot of the traditional student university experience is entirely absent. My view is that what a student is essentially buying on this course is access to academic experts from accredited Higher Education Institutions in the field of GIS who can give valuable feedback for the assessed assignments, and monitoring and guidance for the research dissertation, so that a student can gain the MSc qualification in a very flexible environment that can fit in with a lifestyle that may not allow for the more traditional methods of study. An important aspect of the UNIGIS MSc is that it is continually monitored by external examiners so that it meets the academic requirements and standard for this level of study. Posted by Eddie & filed under IT & the Internet, May 20 2014. My blog is now over seven years old and it was time for a revamp, so I’ve updated it to the latest version of WordPress and redesigned the theme, which is based on WP-Bootstrap, developed by 320 Press. The design also integrates with the rest of my website, which uses the Drupal Bootstrap theme, so now my whole website is ‘responsive‘. 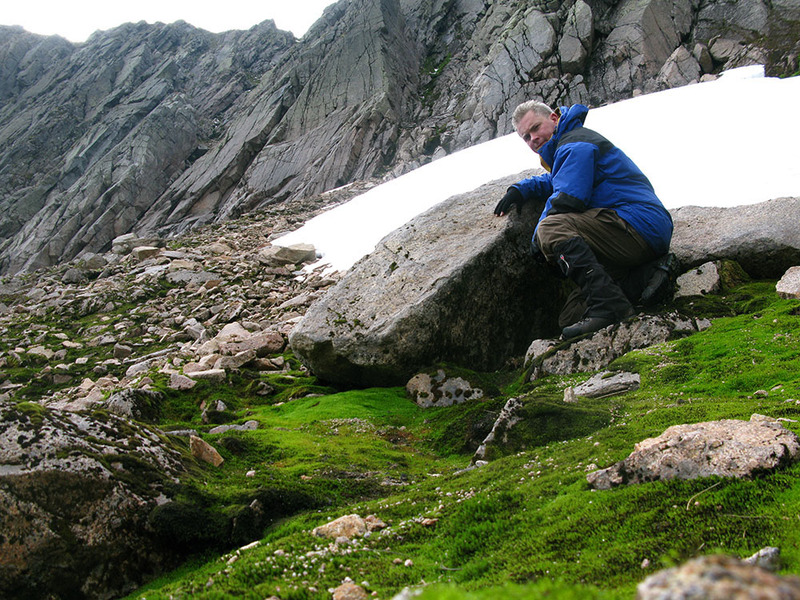 The two papers complement each other and describe different techniques to come to the same conclusion, that glaciers existed in corries in the Cairngorm mountains during the ‘late Holocene’, i.e. significantly later than the accepted date for the end of the last period of glaciation in the British Isles, which was the Younger Dryas stadial (also called the Loch Lomond readvance), about 11,500 years ago. They also speculate (and provide some evidence) that this may have been as recently as the period referred to as the ‘Little Ice Age‘ (LIA), corresponding roughly to the period from AD 1550 to AD 1850. 3 Comments Show comments and add comment. 14 Comments Show comments and add comment. Three weeks ago whilst staying for a week in nearby Kinlochbervie, I climbed the 801m Corbett summit of Cranstackie in Sutherland. Cranstackie (along with its neighbouring Corbett summit of Beinn Spionnaidh) is the most northerly mountain (if you count a mountain as being above the Corbett height of 762m) in the British Isles, and Sutherland is a very dramatic and remote landscape. 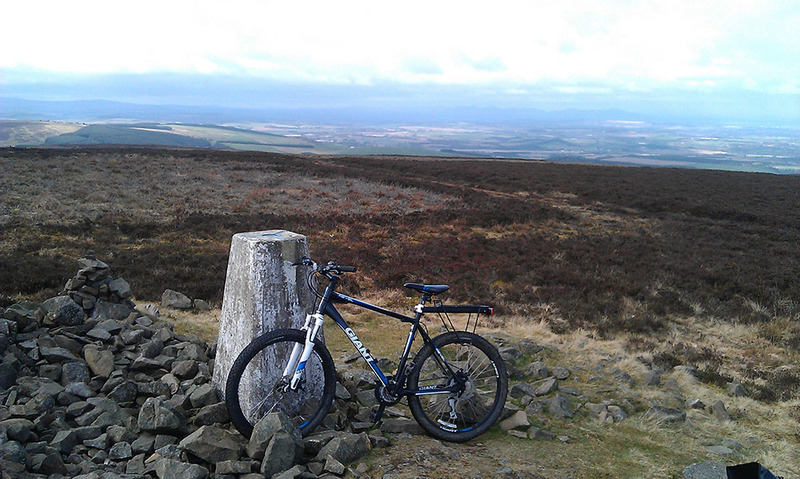 At the end of March I did a 30km cycle route in the Scottish Borders. 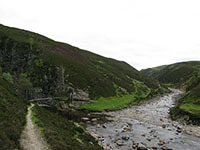 This route was a loop that started and finished at Longyester, and used 4×4 tracks to ascend to the 527m summit of Lammer Law and cross the high moorland of the Lammermuir Hills to the east of Lammer Law, along a track that follows a line of electricity pylons and doesn’t drop much below 400m. There aren’t many places in Scotland where you can cycle on decent tracks at such a high altitude. Unfortunately a new wind farm was being built on the moorland at Fallago Rig which I had to cycle through, although this was a Sunday and the site was quiet. I then continued on the B6355 road, which is one of the highest public roads in Scotland, rising to a height of nearly 440m, before an amazing descent, losing 200m of altitude in 4km. Last week I climbed Ben Nevis with Lesley’s sister, Kate. 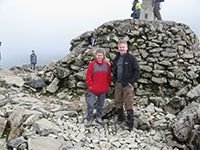 Kate had had an ambition to climb the highest mountain in the British Isles, and asked me to guide her as she is not an experienced hillwalker. Because the aim of the trip was simply to attain the summit, and not take Kate anywhere dangerous or uncomfortable, I chose to do this the simplest way, using the ‘tourist’ route up and down. I knew there are many things about this route that make it a less than pleasant route choice, though, and so it turned out to be! Five weeks ago I undertook an expedition from Blair Atholl to Aviemore. This was a long walk, 66km in total that took me three days with two nights of wild camping. This was a route that I had wanted to walk for a long time as it’s one of the longest largely linear walking routes that can be done in Scotland through terrain that has no public roads or settlements of any kind, and travels through one of the most remote and wild landscapes in the British Isles. It also has the advantage of having a train station at either end meaning that a return journey to the starting point can be done easily by train. 1 Comment Show comments and add comment.